Grand Velas Resort Los Cabos. 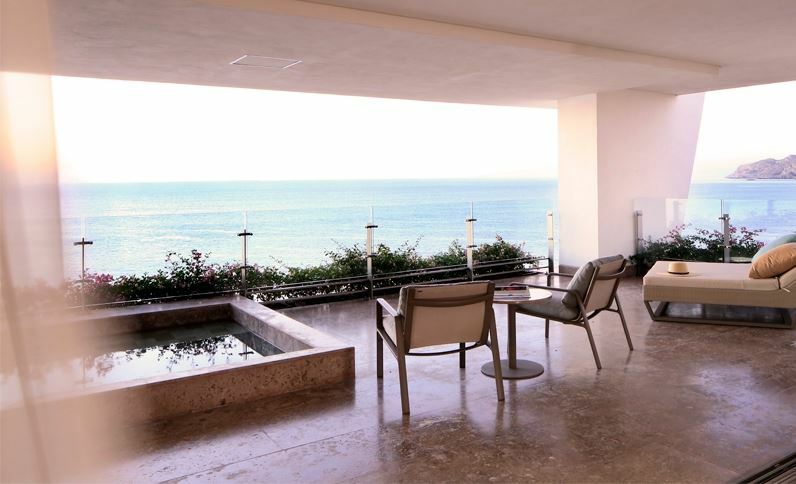 Grand public spaces and each of the sophisticated luxury suites offer vast forever views of the turquoise Sea of Cortez. 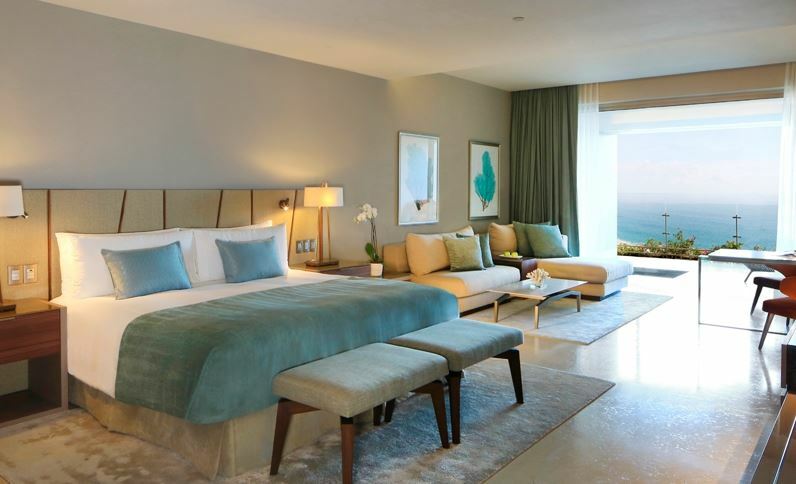 This all-suite hotel, tastefully and comfortably decorated in a colour palette echoing the sea sky and sand. Choose from Ambassador, Ambassador Pool Suites with private plunge pools, Grand Class suites, as well as a regal range of premium suites ranging from Governor, Presidential, to Royal and Imperial suites. Wellness suites are equipped with spa concierge and organic amenities. 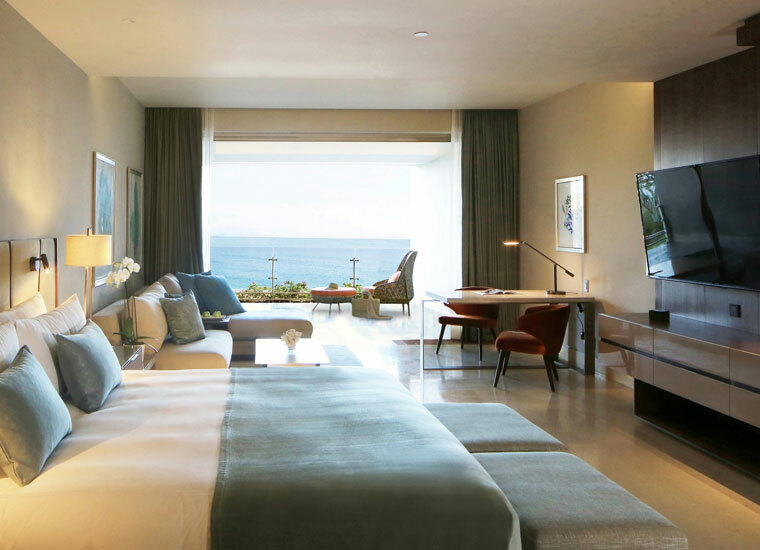 Grand Velas Los Cabos offers an inspired beachfront vacation experience. Stunning curvaceous architecture wraps around three terraced infinity pools leading down to miles of pristine white sand beach great for walking and exploring. Grand Velas provides all the sun, splash and fun you can handle. Separate kids’ pool ensures the optimal pool experience for all. With butler concierge service, your every wish will be granted. Grand Velas wants you to have the best vacation ever. They have a line-up available of off-site land activities like off-road ATV, Outback on Safari, Zip-lining, hang-gliding, or even riding a camel. Explore the beautiful turquoise Sea of Cortez with a variety of water activities, including whale watching, diving, snorkeling, surfing, flyboarding and more, so you can fully experience all that southern Baja has to offer. Sometimes the best vacation is doing nothing at all, and Grand Velas is perfect for rest, meditation, yoga on the beach, and a variety of holistic spa treatments in their state of the art spa. Grand Velas guests enjoy gourmet cuisine and finest wines, with their deluxe all-inclusive meal plans. Explore international menus, selecting from eight onsite restaurants and three Bars, masterminded by Grand Velas’ Two Michelin starred Executive Chef Schutt, as well as 24 hour room service. Included in your room rate are á la carte or buffet breakfast, lunch & dinner at Azul; coffee pastries & snacks at Amat Café, Ceviche & seafood specialties at Cabrilla & Velas 10. Dinners á la carte are available at Grand Velas five signature restaurants: Frida, Piaf, Lucca, Velas 10 & Cocina de Autor. Magnificence on the beach….The FANCY Style is all about quality and exceeding guest expectations. From the resort culture and architecture, to food design, drinks and service, you receive the best of everything… Amazing moments, music, meals and other memorable experiences. Baja is all about beaches, and a delightful stretch of white sand beach is directly outside the front doors of Grand Velas, suited for walking, sunbathing, meditation, or yoga, and observing sea life and coastal birds. Due to strong undertows, swimming in the ocean is prohibited. However just 1.7 miles away, Chileno Bay offers beautiful, swimmable, turquoise waters perfect for swimming, snorkelling, and splashing around. Other great beach options are at Land’s End with its Lovers’ and Divorce Beaches; and Cabo’s world famous Medano Beach with its lineup of beach palapa restaurants, water taxis, fly boarding, and other water activities only a 15 minute drive away. Located on the Cabo Corridor, about 35 minutes drive from SJD International Airport. Take in your own private ocean view as you relax in this chic suite with original artwork and design inspired by the Baja scenery. You’ll enjoy a range of luxury amenities plus unique extras. Lounge on the terrace; soak in your jacuzzi and enjoy restful sleep in your king size bed. This suite allows you to experience true splendor. Take in your own private ocean view as you relax in this chic suite with original artwork and design inspired by the Baja scenery. You’ll enjoy a range of luxury amenities plus unique extras. Lounge on the terrace; soak in your jacuzzi and enjoy restful sleep in your 2 queen beds. Relax in your own private plunge pool overlooking the turquoise waters. Dip in, cool off, and sink in to your lounge chairs on the terrace. Pour a drink from the mini bar and order a light lunch to enjoy by the sea. This suite offers a restful experience enhanced by sophisticated décor, chic design and the healing powers of water. Unwind at the end of your day in a luxurious king sized bed. Ideal for up to 3 adults, 1 minor/junior (ages 4-15) and 1 infant (age 0-3). Relax in your own private plunge pool overlooking the turquoise waters. Dip in, cool off, and sink in to your lounge chairs on the terrace. Pour a drink from the mini bar and order a light lunch to enjoy by the sea. This suite offers a restful experience enhanced by sophisticated décor, chic design and the healing powers of water. Unwind at the end of your day in two luxurious queen sized bed. Romantic escape to this suite for romance and pampering. Enjoy in-suite massages and relaxed private meals on the terrace. Experience the luxury of your own private plunge pool overlooking the Sea of Cortez; this is an indulgent, sophisticated space to soothe, reconnect and experience true enchantment. This spacious suite makes family vacations comfortable and luxurious, with two separate bedrooms and two Spa-like bathrooms with jacuzzis. Kids delight in mini bars with snacks for every taste, while adults are welcomed with a bottle of tequila and fine wines. From the terraces to sofas and plush sleeping areas, room to relax ensures families always feel at home. Located beachfront, right on the Carretera Transpeninsular Km 17.3 (also known as the Cabo Corridor) Grand Velas Los Cabos is approximately half way between the picturesque cultural centre, art district, vibrant dining scene in the town of San Jose del Cabo, and the tourist mecca of Cabo San Lucas at Land’s End with its nightclubs, beachfront restaurants, marina and shopping. Staying at Grand Velas gives you the best of both worlds. An oasis where desert meets sea, with two towns within easy reach. The array of restaurants at Grand Velas ensures you’ll never get bored or go hungry… Cabrilla for freshest catch of the day and ceviches in a casual poolside terrace. Azul for casual family style International buffet dining all day Amat Café for refuelling and refreshing coffees, smoothies sandwiches, salads and sweeties. Lucca for Italian cuisine, Cocina de Autor with its playful 8-10 course tasting menu. Frida for gourmet Mexican cuisine with a contemporary twist. Piaf offers French cuisine and an extensive wine selection. Velas 10 Al fresco oceanfront dining with Wagyu beef and freshest bounty from the sea. As well, three bars are ready to fill your glass: Koi Bar for late night dancing; Miramar Bar for handcrafted cocktails on the terrace, or hit the roof at Sky Sports Bar. SE Holistic Spa by Grand Velas offers total transformation in this sanctuary setting. Guests can renew, revive and replenish body and soul, in a serene desert oasis, utilizing healing elements found in Baja. Combine nature and tradition, and lose yourself in the 7-step water journey including an ice room, a clay room, and an experience pool. Try the signature Blue Agave massage, and couples can reconnect with rituals and special treatments designed for two. Everyone is welcome at Grand Velas Los Cabos, including children and teens. Pets are not allowed. The 24 hour personal Concierge in hotel, at pool and on the beach will assist you in finding and arranging whatever you may be looking for. Free valet and self parking, as well as assistance in arranging rental cars. Hotel amenities such as the Activities Center, Holistic spa, and Fitness Center keep you looking and feeling fabulous, and occupied — if you like. Babysitting, Kids’ Club & Teen’s Club keep the under 19’s happy, so the parents can fully relax and enjoy their vacation. Free wifi in suites and 24 hour room service always available. Just 4 kilometres from Cabo Real Golf Club, and not much further from ten other Cabo Golf Courses, Grand Velas Los Cabos can put you on the links wherever you want to challenge your golf skills. The terrain in southern Baja provides a wide variety of landscapes, ranging from desert, to deep arroyo ravines, mountains, and of course beach with endless sea views. Ask your concierge to set up tee times at whichever course you desire, keeping this in mind. Fiesta Americana Cabo All Inclusive Resort is the perfect balance of luxury standards & price. Your visit will be defined by exclusivity, luxury and distinction.